El Blason is not your usual tapas and sangria restaurant, Just off the lively and popular King street this restaurant is set in a trendy, modern setting offering the very best of Spanish cuisine and hospitality. Rich furnishings adorn the restaurant and artwork hung and set against walls is adorned with nautically themed art and objects. The ambience is quietly relaxed and caters to the sophisticated customer. When you enter this elegant and stylish restaurant, you are guaranteed a refined eating experience featuring a Spanish menu so beautifully put together that you'll be tempted to order the lot. El Blason wants to give you the full Spanish experience, and it succeeds brilliantly. 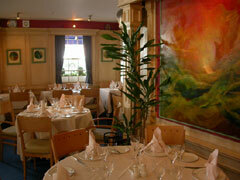 The very high standard of food, and personal service found here ensures your visit is a special occasion every time. The wines are complementary to the menu and the Rioja is a treat. Spanish cuisine is known for its wide use of innards or uncommon cuts of meat like tongue or feet. Meats are usually marinated for a short time before being fried in a sauce of vinegar, oil, garlic, and onions (adobado). Specialties include paella spiced saffron colored rice, garnished with shrimp, crab, Spanish sausage, and pieces of fried pork, beef, chicken, and lamb.